JR Narita Express – This is the fastest and most convenient way. It requires a seat reservation, so be sure to make one (without any additional fees) when you exchange your JR Pass voucher. The one-way trip takes about an hour. JR Sobu Line – The journey takes about an hour and a half. Spend your second day in Japan checking out some of the most popular cherry blossom viewing spots in and around Tokyo. Shinjuku Gyoen – Shinjuku Gyoen is a large, spacious public park in Tokyo that features a traditional Japanese landscape garden with ponds, bridges, islands, and a wide variety of shrubs, plants and trees.To get there using your JR Pass, take the Chuo/Sobu Line to Sendagaya Station. The park’s Sendagaya Gate is only a five-minute walk away. Chidorigafuchi – A moat found northwest of the Tokyo Imperial Palace, Chidorigafuchi is an Edo Period site that is home to almost 300 cherry trees that line its 700-metre long walking path.It is about a 20-minute walk from JR Iidabashi and JR Ichigaya Stations, which are along the JR Chuo and JR Chuo/Sobu lines. Koishikawa Korakuen – Considered one of the best and oldest traditional Japanese gardens, Koishikawa Korakuen is an Edo Period garden that features man-made hills, ponds, walking trails, and trees that recreate miniature versions of Japanese and Chinese natural scenery.Take a JR Chuo line train to Iidabashi Station, and walk about five to ten minutes. Yokohama Sankeien Garden – The Sankeien Garden in Yokohama is a large Japanese style garden that houses several historic buildings, teahouses, the three-storey pagoda and main hall of the old Tomyoji Temple of Kyoto, flowering plants, small rivers and a pond.From Tokyo, take the JR Keihin-Tohoku Line to Yokohama Station, and then transfer to the JR Negishi Line to Negishi Station. The garden is about a 30-minute walk away. 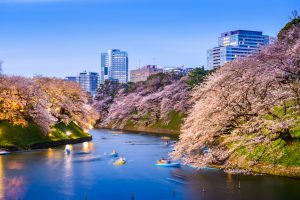 Yokohama Ookagawa River – The Ookagawa River has a five-kilometre walking trail along its banks that is lined with cherry trees.To get there from Yokohama Station, take the JR Negishi Line to Sakuragicho Station. Yokohama Minato Mirai 21 – Minato Mirai 21 is an urban district found by the sea in central Yokohama.To access it using your JR Pass, board a JR Negishi Line train to Sakuragicho Station. Mt Fuji – Mt Fuji is Japan’s highest mountain, and is surrounded by many areas that offer fantastic sakura viewing spots, particularly the Fuji Five Lakes region.From Tokyo, take the JR Chuo Line to Kawaguchiko Station. Please note that transport around the Fuji Five Lakes area is via buses that are not covered by the JR Pass. Bokutei Cherry Blossom Festival (31 March – 8 April) – This festival is held adjacent to the Sakurabashi Bridge in Sumida, where there is a 1.3-kilometre line of bokutei sakura trees.Take the JR Utsunomiya, Takasaki, Keihin-Tohoku, Yamanote, or Joban Lines to Ueno Station. Then transfer to the Ginza Line going to Asakusa Station (not covered by the JR Pass, one-way cost is 170 yen). The site is only a five-minute walk away. Ueno Cherry Blossom Festival (20 March – 8 April) – This festival is held at Ueno Onshi Park, which is home to approximately 800 cherry trees.It is located about a two-minute walk from JR Ueno Station. From Tokyo Station, take a Shinkansen to Nagano Station and then transfer to a Ltd Exp (Wide View) Shinano train to Matsumoto Station. The one-way trip takes about two hours and twenty minutes, and is fully covered by the JR Pass. 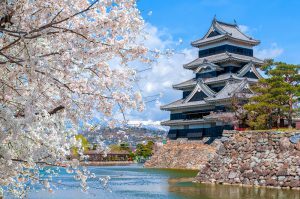 Nagano Prefecture’s second largest city, Matsumoto is home to one of the most beautiful original castles of Japan, the Matsumoto Castle, and numerous incredible sakura viewing spots. Takato Castle Ruins Park – Regarded as one of the three best cherry blossom viewing sites in the country, along with Yoshinoyama and Hirosaki Castle, the Takato Castle Ruins Park is home to around 1,500 sakura trees.From Matsumoto Station, take the JR Shinonoi/Chuo Line to Okaya Station, and then transfer to the JR Chuo Line (branch)/Iida Line to Inashi Station. From Inashi Station, take a 20-minute bus ride (one-way ticket costs 520 yen) to Takato Station, then walk about 10 minutes to the park. Only the train journeys are covered by the JR Pass. Koboyama Koen – Found on a hill in the southern part of the city, Koboyama Koen is a park that overlooks the valley and is home to about 4,000 cherry trees.From Matsumoto Station, board a JR Chuo Line train to Minami Matsumoto Station and walk about 30 minutes to the park. Matsumoto Castle – The Matsumoto Castle grounds have around 300 cherry trees and are a great picnic spot from which to not only enjoy the beautiful sakura blooms but also the majestic castle.From Matsumoto Station, the castle is only a 15-minute walk away. Train travel between Matsumoto and Osaka takes about four and a half hours. From Matsumoto Station, take the Ltd Exp (Wide View Shinano) Line to Nagoya Station, then transfer to a Shinkansen going to either Shin-Osaka Station (where you can take the JR Kyoto Line Local) or Kyoto Station (where you can take the JR Special Rapid Service Line) going to Osaka Station. The entire trip is fully covered by the JR Pass. 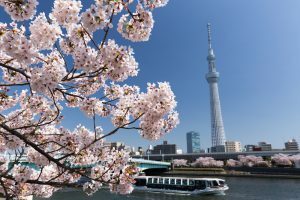 Osaka and its surroundings offer top-notch cherry blossom viewing spots that attract crowds of locals and tourists during the peak cherry blossom season. Kema Sakuranomiya Park – This park is located close to the Okawa River, which is lined by about 5,000 cherry trees.Take the JR Loop Line and disembark at Sakuranomiya Station. 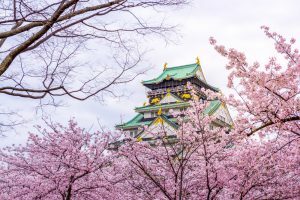 Osaka Castle – Home to more than 4,000 sakura trees, the grounds of Osaka Castle provide a great spot from which to view the pink cherry blossoms and beautiful castle tower.The castle is located about a 20-minute walk from Osakajojoen Station, which is on the JR Osaka Loop Line. Osaka Mint Bureau – With more than 100 varieties of cherry trees, the Osaka Mint Bureau is open for a week in the middle of April every year for cherry blossom viewing.It is a 15-minute walk from JR Osaka Loop Line’s Sakuranomiya Station. If you have time for a quick trip beyond Osaka, check out the Philosopher’s Path in Kyoto for an amazing cherry blossom viewing experience. Philosopher’s Path in Kyoto – The Philosopher’s Path is a two-kilometre stone path found in the northern portion of Higashiyama in Kyoto. It follows a canal that stretches from the Ginkakuji area to the Nanzenji neighbourhood, and is lined by several hundreds of different varieties of sakura trees.From Osaka Station, take the Tokaido-Sanyo Line to Kyoto Station. The one-way trip takes about 35 minutes and is covered by the JR Pass. Then, from Kyoto Station, hop on bus number 5, 17, or 100 for a 40-minute ride. This leg of the trip costs 230 yen and is not covered by the JR Pass. To return to Tokyo, get on a JR Kyoto Line local train going to Shin-Osaka Station, where you can board a Shinkansen headed to Tokyo. The whole journey takes about three and a half hours and is fully covered by your JR Pass.